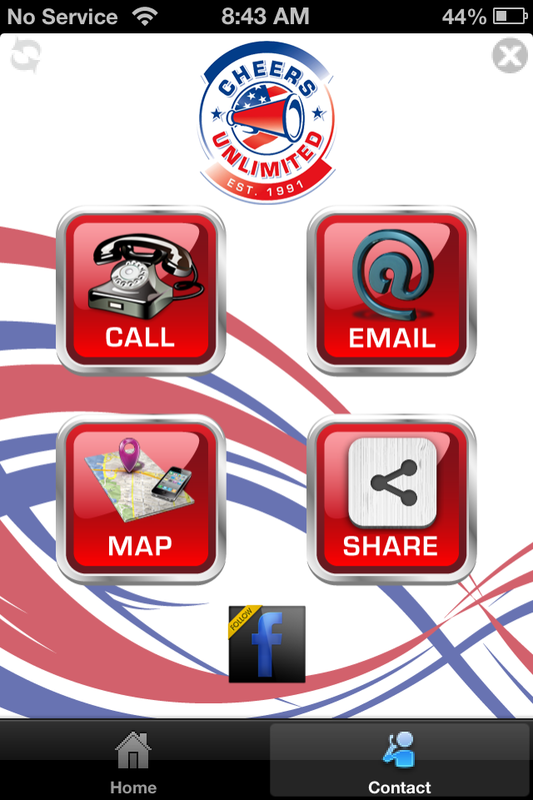 For the tech-challenged, a mobile application (or “app”) is a program designed for mobile devices like smartphones and tablet computers. Apps are distributed through application distribution platforms that are operated by the company behind the device’s operating system. For instance, iPhone users download apps from iTunes and the Apple App Store, and Android users download from Google Play. How does this all play into running a cheer business? Most gym owners create an app to meet two main objectives: communicating with existing customers and marketing to new ones. Find out how it works—and whether it’s worth it. At Future Extreme Cheerleading in Loganville, Georgia, gym owner Micah Redden is currently developing an app that he hopes will help ease his workload. Not only will he be able to notify parents and students of schedule changes and class openings, but the app will also update the online schedule so that he doesn’t have to maintain the gym website separately. Since Redden needs to communicate with various groups, the app will also allow him to choose what information to send or “push” to selected people. “Basically what gym owners want from an app is to advertise, publicize and notify,” says Redden. Like Redden, many gym owners use push notifications to alert their app users of special events, schedule changes, promotional offers and other updates. The perk of push notifications is that they get more attention than emails and texts, since they automatically appear on a user’s smartphone and demand instant attention. Depending on the app’s design, gym owners can either schedule a specific day and time for the notification or send it themselves. Another increasingly popular feature is the Quick Response (QR) code, a square bar code that can be scanned by smartphones to quickly access a website. Tanya Roesel of Midwest Cheer Elite in West Chester, Ohio features QR codes prominently when advertising to potential athletes. QR codes are on many of Midwest Cheer Elite’s marketing materials, offering easy access to event information, promotional discounts and links to social media. “What’s great about QR codes is that they don’t take up a lot of space and they provide an automatic link to us,” Roesel explains. When choosing an app designer, it’s also key to hire a company that offers ongoing service support in light of the ever-changing market. Whenever new devices or updated versions of smartphones are released, they require updates in order for an app to work properly. So, unless you’re a software wizard, most would advise leaving the design and maintenance to a professional. Another advantage of hiring a mobile app developer is the ability to check analytics. 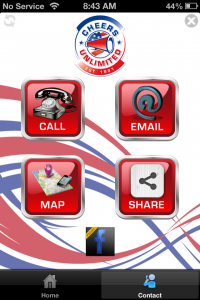 “My customers like the easy access to usage reports that can tell them how many people have downloaded and used their apps,” says Gene Cook, owner of 1BoxApps, a mobile app design company in Temecula, CA that has designed apps for Matrix All-Stars, Cheers Unlimited and Five Star Athletics. As your first point of contact with potential members, your website needs to effectively reflect the professionalism of your program. The best way to accomplish that is to enlist a skilled web professional to create a visually appealing and easy-to-navigate website. As for content, Silverman says the top priority should be sharing information that potential athletes (and their parents) need to make an informed decision about whether your program is right for them—and vice versa. Hiring a professional doesn’t necessarily have to cost a fortune, either. For gym owners on a tight budget, utilizing a template can be a cost-effective solution. Template-based websites are often easier to update and typically cost much less to set up than something designed from scratch. “One of the biggest benefits is the speed at which you are able to get the site up and running,” says Kim Smith, customer service manager for JAM Web Designs, Inc.
As for concerns about originality, rest assured that you can still achieve a unique look even with a template-based site. “Not only do we work with new clients to ensure their site differs from local competitors, but we also retire popular styles that seem to fly off the shelf,” shares Smith. If you truly want a one-of-a-kind site but have to be mindful of budget, consider a happy medium. Services like St. Louis-based Vault Media offer a custom-designed, SEO-optimized website and one year of web hosting for a package price of $1299 (a fraction of what many web designers charge for a site designed from scratch). They also teach newbies how to use content management systems like Joomla and WordPress so that you can update your site on its own once it’s up and running. Design is just the first bridge to cross, as your site also needs to be search engine optimized and meet certain keyword criteria. Silverman says that, generally speaking, parents will research activities for their children by Googling a term like “cheerleading for kids Randolph, New Jersey;” Google will then produce a bunch of results that best meet that criteria—and the higher your website shows up, the better. For those who want to go the DIY route, there are numerous ways you can ensure your own success with search engine optimization (SEO). Silverman says that using a WordPress site is a “must” for being SEO-friendly, as is installing Yoast’s WordPress SEO plug-in. It’s important to keep your site active by updating your blog regularly and including strategic keywords in your posts. “Think about what a mom would enter into Google when she sits down at her computer,” advises Silverman. After posting, share the link across your social media channels to give it maximum exposure among your audience. However, Chris Quarles of Vault Media cautions that professional SEO assistance may still be necessary, especially if you live in a market where the all-star cheer business is competitive. When developing their new program, they reviewed almost 500 gym websites and learned that 80 to 90 percent are not properly set up for search engine optimization. “Working with someone who knows how to code properly on the backend with SEO and proper keyword relevance in mind can really help gyms be on top of their game—and on top of the results for their market,” says Quarles. Just as important as what to include is what to avoid when designing your site. A common mistake website gym owners make is choosing design over function. “Many of the sites in the cheer world use overly flashy designs, which actually take away from the job that the website is trying to do—get prospective members interested in your program,” explains Silverman. For instance, Flash sites look pretty, but can’t be viewed on Apple devices—frustrating a significant sector of mobile users. Another common faux pas is not including some sort of “road map” to help visitors get around your site and find information quickly. “Most people don’t know what to do when they get to your website,” shares Silverman. He recommends creating a helpful welcome video that tells them exactly where to go and what to read first, citing PrideCheerGym.com as a great example of this in practice. From Smith’s perspective, balance is the key to every website. “When selecting a style, you want to make sure to find one with the right type of cheer flair for your gym, so that it compliments your identity,” she advises. Sticking with a clean color palette is extremely helpful as well; Smith says too many colors outside the realm of your branding doesn’t add “pop,” but is actually disruptive. 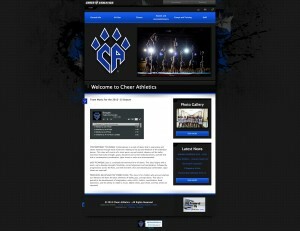 Silverman believes a lead generation tool/opt-in box is an essential element in any successful cheer gym website. With this tool, potential clients fill out a form with their name and email address, and in return, they get a special report or other information that parents will find helpful. For instance, Tracy, CA-based Athletic Perfection offers a free PDF on “Building Champions from the Inside Out,” while Macon, GA-based Middle Georgia Cheer Extreme offers a free video on improving jumps. When it comes to getting the word out, social media is key. Posting on Twitter and Facebook regularly will drive people from social media to your website—where they can take the next step to joining your gym. You can also encourage athletes to “check in” to your gym on FourSquare to build further awareness. And after that? Just promote, promote, promote. Smith suggests making your web address visible in every possible aspect of your life: your email addresses, signage, bumper stickers, T-shirts, flyers and any other marketing materials. Follow these tips, and your website is sure to “click” with its intended audience.